Spring Event: An awesome night of dinner, dancing, and auction! The evening begins with a silent auction where you can bid on baskets created by each grade as well as other fun experiences or items, including the opportunity to let your child be principal for the day! After dinner there is also a live auction. Golf Tournament: The OLR Golf Tournament is a fun filled day. Groups of parents, parishioners, and friends meet at Recreation Park for an afternoon of golfing. There are additional games such as a putting tournament, a driving tournament to “beat the champ,” and ___. The day closes with a nice dinner and an auction. The Golf Tournament is our largest fundraiser of the year. Community Nights: On community nights we partner with a local restaurant and host an event where part of the proceeds from the night are donated to Our Lady of Refuge Catholic School. Past fundraisers have occurred at Domenico’s Italian Restaurant, Flippin’ Pizza, and Frostbites Crepes and Frozen Delights. We also hold Food Truck fundraisers where food trucks park in our lot and agree to donate a portion of their sales to the school. Lenten Fish Dinner: On Friday evenings of Lent, we host a fish dinner for our community. 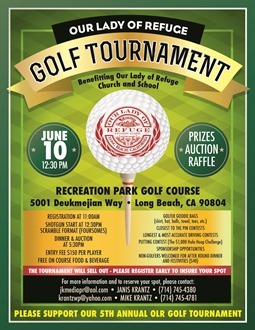 This event is fun for the family and builds builds community based in our catholic identity. In-N-Out Food Truck: Each year, an In-N-Out food truck comes to our school. Students pre-order for this event and have a special lunch. Of the money raised, 75% goes to our school, and the remaining 25% is donated to the In-N-Out Burger Foundation to help abused children in local communities. The money raised goes to student council.